Head of the National Iraqi Alliance, Sayyid Ammar al-Hakim, received a number of sheikhs and figures of the holy province of Karbala in his office in Baghdad Saturday, 14/10/2017, his eminence indicated that implementing legal and constitutional actions calmly will maintain the unity of the country and ensure the continuation of strength and sustainability of victories. His eminence indicated that constitutional and legal measures would guarantee the rights of all Iraqis, including Kurds, noted the importance of continuing enforcing of these federal measures quietly without aggressive statements in media. His eminence pointed out that the countries of the world opinion on Iraq today is not like how it was in 2003. Today, Iraq is strong and victorious and this victory must be maintained by adhering to the Constitution and taking decisions in the public interest plus leading the country through men of state manners and not through shouting. .
His eminence pointed out that Iraq will soon exit the bottle-neck, especially after the end of terrorist groups of Daesh, the next phase requires to focus on services, called for educating the public to elect who has future service project based on investment and jobs and find a synergized team to provide services. His eminence pointed out that the Al-Hikma National Movement seeks to find agreement between various components of the country, the general conference includes all qualified individuals and potentials of different backgrounds and affiliations. 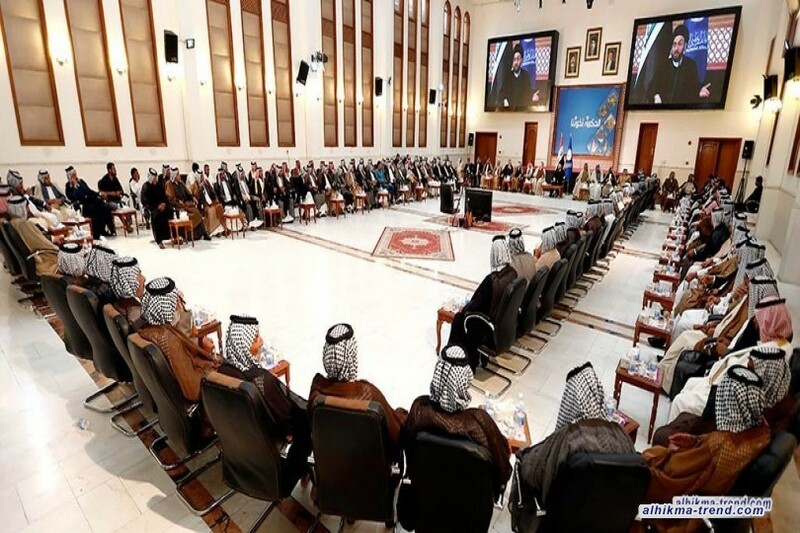 The tribal leaders also stressed the importance to preserve unity of the country and prevent division, reaffirmed their support for the comprehensive national project, which serves the interests of all Iraqis ..